Extolled at its first hearings in the shop of Aristide Cavaillé-Coll in 1864, the organ commissioned by the Marquis de Lambertye for his private chapel in Gerbéviller and standing since 1913 in the Church of Saint-Maurice-de-Bécon, spent a considerable span of its life in perfect anonymity. The restoration henceforth completed upon its hundred fiftieth anniversary enables us to rediscover an instrument that its instigator deemed ‘beyond the norms and unique’. The richness of its tonal palette, the finesse of its timbres and its incredible dynamic range make it an ideal musical instrument: a faithful servant of the repertory and unending inspiration for the performer. The thematic or monographic programmes of the collection ‘Eoline’ bear witness to this potent encounter between music, organ and performer. February 1851: Under the auspices of Aristide Cavaillé-Coll a young Belgian organist stuns the elite of the Parisian musical world performing Bach’s masterpieces and his own virtuosic compositions. Soon his French pupils Guilmant and Widor take up the banner of the new modernity. 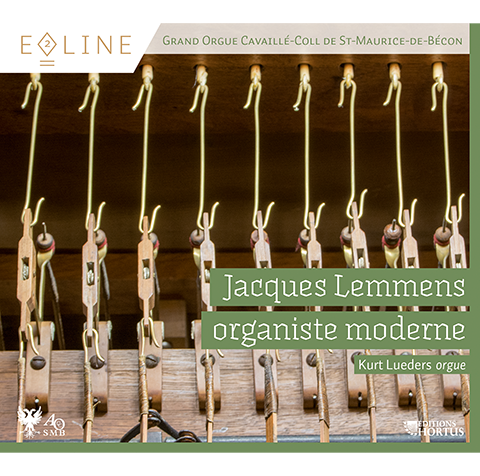 A decade hence, Lemmens’ Three Sonatas, majestically blending polyphony and lyricism, confirm the blossoming of a new French Romantic organ school.